This is a slightly doubtful genealogy. Was it the last emperor of the Roman Empire of the East or was it one of the Caesars? I have the impression that one can make on this biography a comment along the lines of “Ambiences and Customs.” (*): the existence of the marvelous in the Middle Ages, but not the marvelous as a fable or legend but as something actually achievable. And achievable with a queen of misty Scotland, faraway Scotland, still a land of missions. 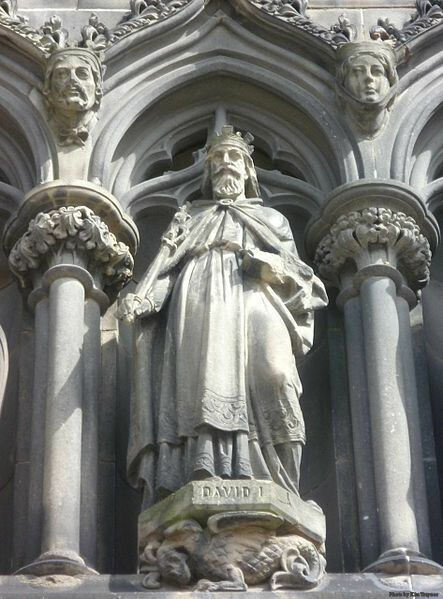 St. David I of Scotland, son of St. Margaret. Statue on the West Door of St. Giles High Kirk, Edinburgh. That real flower arises in the middle of that people, still a bit savage. She is a princess bringing to Scotland the most illustrious blood, the fine flower of Western civilization, while at the same time she is a marvelous queen that brings up her many children to a state of perfection, illustrious for their virtue; a queen who intercedes for the people, gives alms, works miracles, all with the unction of the royal crown. All this presents such a complete idea of royalty, and also of a concrete world in which marvels are possible and the extraordinary and stupendous are achievable, that it ends up being a plenitude of the axiological principle, of the affirmation that things can be in order, that they are naturally disposed in an orderly fashion, and that even the most marvelous and audacious order is achievable on earth. It is interesting to see how all this contrasts with the minimalism of a certain kind of apostolate done today. Managing to have someone behave more or less correctly is already a reason to celebrate. At that time, the apostolate of the Church was maximalist. Queens should be holy and some were indeed. 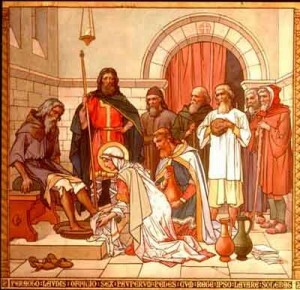 Those saints spread the good odor of Our Lord Jesus Christ so much and so far and wide that they ended up by sacralizing the royal dignity itself and by creating a kind of fairy tale environment, a marvelous ambience in medieval civilization of which stain glass windows are precisely a reflection. St. Margaret’s Chapel, 12th Century. 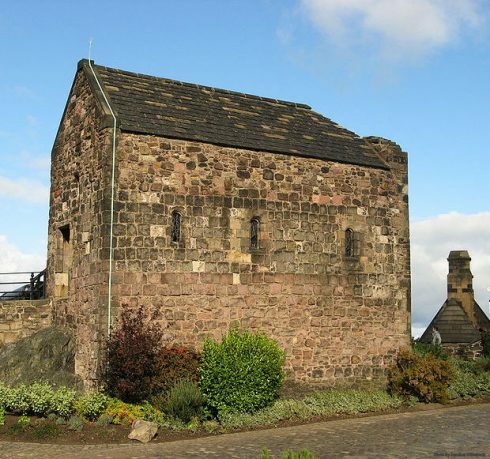 The oldest building in the castle built by King St. David I and dedicated to his Mother, St. Margaret, who died here in 1093. Stain glass windows present saints on a background of burning fires, pieces of golden glass, ruby or emerald-colored glasses, with a light upon their heads, a crown on a table here, a saint spreading flowers around herself there, and so on. All this is an image of the very way in which medieval man conceived the life, for example, of a Saint Margaret Queen of Scotland. Naturally, this prevented people from turning to the cult of the hideous and from seeking to entertain themselves with the often scandalous lives of actors, actresses, football players and many other such things. Because, like it or not, people seek the marvelous. 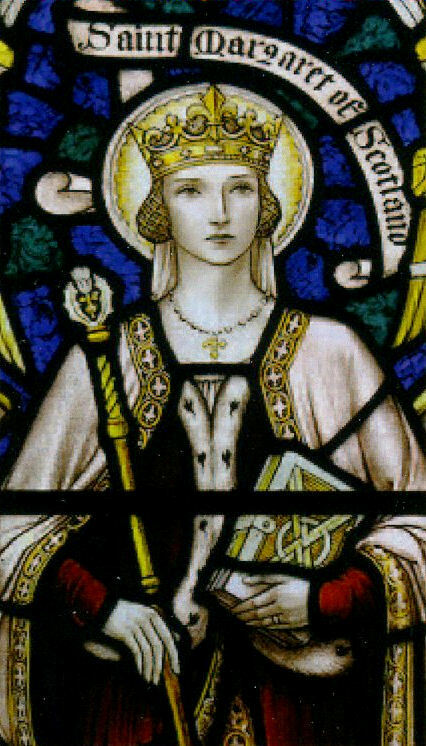 In order to gauge what effect the life of someone like St. Margaret would have on people, imagine, for example, if Princess Margaret Rose were to convert now and begin to work miracles, to be seen giving alms to the poor in a non-socialist fashion, having children who are regarded as true saints, all of it happening in an ambience of legend. She would be hated and a horrible persecution would be unleashed against her, but at the same time, thousands of souls would quiver with enthusiasm for her. Her picture would be found in worker and peasant houses all over the world. How much that simple fact would impress! And how prodigiously it would impress! At that time, in Scotland, the prestige of a queen, and a fortiori a princess, was immensely greater than it is today. 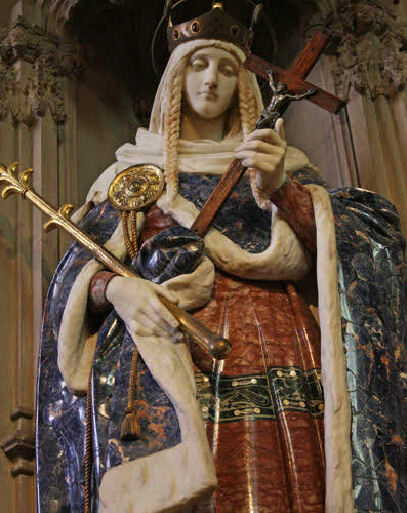 You can imagine what the fame of St. Margaret, Queen of Scotland, was like throughout Christendom. This is where one understands the good that all this would do. I will say more: imagine all this was done, not by Princess Margaret Rose but by the Queen of England. Could someone overthrow the English monarchy? Perhaps, because, placed in this line, the English monarchy would be either the most fragile or strongest of institutions. But I say that if they were unable to topple it, no one would be able to do it for many centuries; and that is because a true and great saint sat on the throne. Let me now make an application and ask a question: why have saints like that no longer appeared in royal families? One could even claim that such saints appeared in royal families after the Middle Ages, but they were neither as great nor as illustrious. 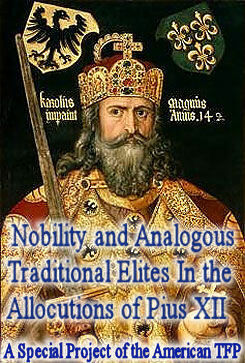 There are traits of sanctity in royal families after the Middle Ages. But the Revolution came, dethroned, liquidated and reduced many of those families to nothing. And with that they received from God the favor of his punishment. And when one might think that sanctity will flourish in their ranks, one sees that sanctity become rarer than ever. Is there, in this fact, a chastisement which they refuse, or is it a punishment for all Christendom? For a holy king is often raised up as a reward for the people; and the people are less and less deserving of a holy king, prince or leader issued from a royal bloodline. And because of that, they are disappearing. These commentaries are drawn and adapted from a meeting given by the author on June 9, 1964. He was not able to review them prior to this publication. (*) “Ambiences, Customs, and Civilizations” was a series of articles written by Prof. Plinio Corrêa de Oliveira. These articles were written for many years and were published by the Brazilian cultural monthly Catolicismo.